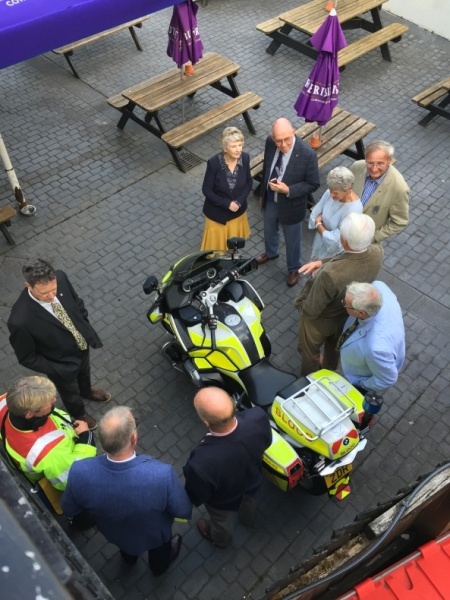 Members of Wadebridge Rotary Club recently had a very interesting and informative talk about Cornwall Blood Bikes, by one of their volunteer riders, Andy Bellamy. As a bonus, he brought along one of the motor cycles so that members could have a good close-up look and also to pose on the bike for photographs. (Club President Mick had to be persuaded to mount the bike). The group consists of self-funding volunteers who live in various parts of Cornwall. They provide an out-of-hours delivery service from 5-00pm to 7-00am on weekdays and a 24 hour service at weekends and Bank Holidays. They have an agreement with the NHS to deliver essential whole blood, pathology samples, medication, medical equipment, medical notes and even donor breast milk to hospitals and hospices throughout Cornwall and beyond. If it fits in the pannier, it can be transported. Calls for urgent deliveries from midwives, nurses and doctors are received by the group co-ordinator, who ascertains that the need is urgent (and can’t wait until the morning) and is of a medical nature. Deliveries and collections are made to their nearest hospital enabling a fast and efficient service. The co-ordinator checks the rota to see which volunteer is available and arrangements are made. The furthest distance travelled is to a children’s hospice in Bristol, but a relay service is arranged with affiliated groups, so that riders do not have to ride long distances and return. Interestingly, Andy likened the system to the Rotary Wheel, with the hub representing the co-ordinator, the spokes being the route devised and the cogs being the volunteer riders. No payment is received or expected for the service. There is a considerable financial saving to the NHS with some hospitals, through ignorance of the service, still using costly couriers or private taxis. It is estimated that in 2017 in excess of £175,000 was saved by the local NHS with journeys covering over 96,000 operational miles completing 2100 jobs. During normal working hours, the NHS uses its own transport. Andy told us that they ride in all weathers except for icy road conditions. In these cases a small van based near St Austell is used as a safety measure. They ride to the speed limits and rarely use the ‘blues and twos’. A registered charity, the group relies on fund raising and donations. The money is used to maintain the motorcycle fleet and to purchase newer bikes. Current bikes are usually ex-police, with considerable mileage on the clock. The volunteer riders do not receive (and do not expect) payment. They are members of the National Association of Blood Bikes whose membership of blood bike groups is countrywide, encompassing hundreds of qualified advanced motor cyclists. 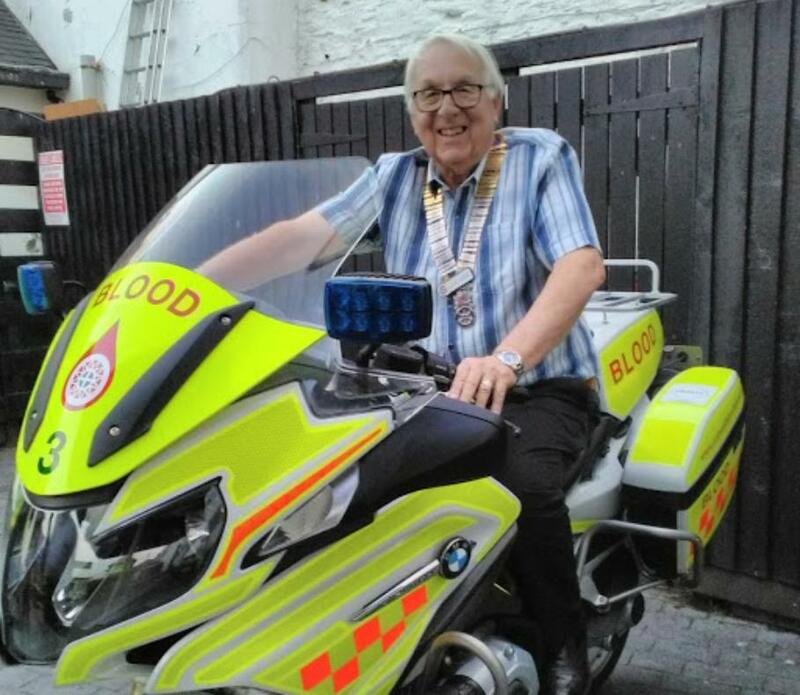 Not many people know of the existence of blood bikes and Andy was thanked for his contribution. To find out more, then their website is: www.cornwallbloodbikes.org.